Introducing Virtu 2-layer. Engineered. Beautifully. 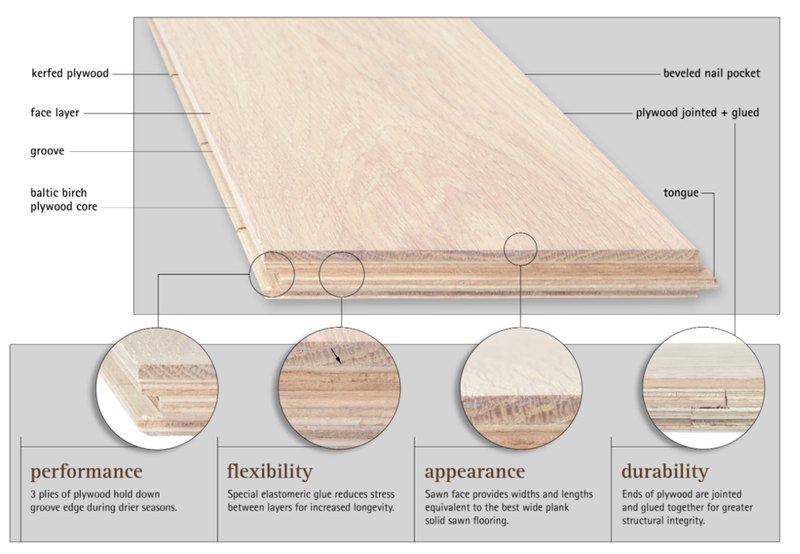 Virtu 2-layer is a ‘wood-on-plywood" engineered floor well-suited for narrower plank widths 4”–8”. Engineered to the same exacting standards of our 3-layer flooring, Virtu 2-layer is custom crafted by skilled American workers to be the best 2-layer floor available. Moisture resistant glue, 15 mm, 11-ply Baltic Birch plywood and a process that strikes the perfect balance between strength and ease of installation are at the core of what makes Virtu 2-layer an informed choice. The tongue and groove profile is specifically designed to minimize the dry cupping that can occur in some engineered floors. Virtu 2-layer also utilizes a unique joint in the plywood sub-structure that enhances the structural integrity of the floorboard. The scoring on the back of the Virtu 2-layer plank has been scientifically tested for strength and ease of installation. We laminate the face layer to the plywood with an advanced adhesive. There is no added formaldehyde, and no added water. Instead, there is added beauty. And beautiful engineering.